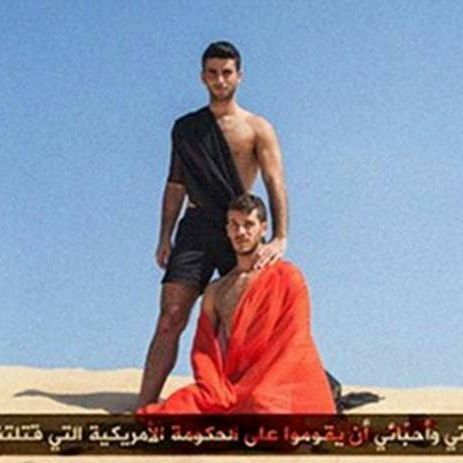 An ISIS-themed gay party held Friday is facing backlash because … the event was ISIS-themed. In one particularly inflammatory image, two hunky, toga-clad men (theme much?) appear to be reenacting a scene from the video showing the beheading of American journalist Jim Foley. On Facebook, party organizer Drek has the image of a shirtless, speedo-clad man flying the Black Standard flag as the event’s cover photo. The image even more reminiscent of the beheading videos, however, was apparently removed. The Hebrew-speakers at Ynet also note that the word Drek used for “stubborn” can also mean “hard-necked,” which, if intentional, is a very poor pun about a group that carries out frightening beheadings.